Inside: Are you going to homeschool second grade this year? 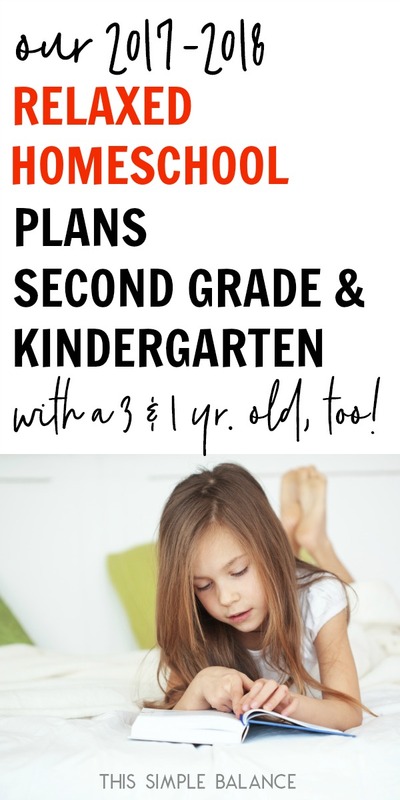 Get ideas for second grade homeschool curriculum from our second grade homeschool plans (with a kindergartener along for the ride!). It’s almost time for another homeschool year! I can’t believe how the summer has flown by. I don’t feel ready, but whether I’m ready or not, school is coming. We will have one child in second grade and one in kindergarten, but the majority of my homeschool plans, curriculum, and schedule are focused on our second grade daughter. We have four kids (three boys), and I often choose homeschool curriculum that can be adapted and used with a variety of ages. 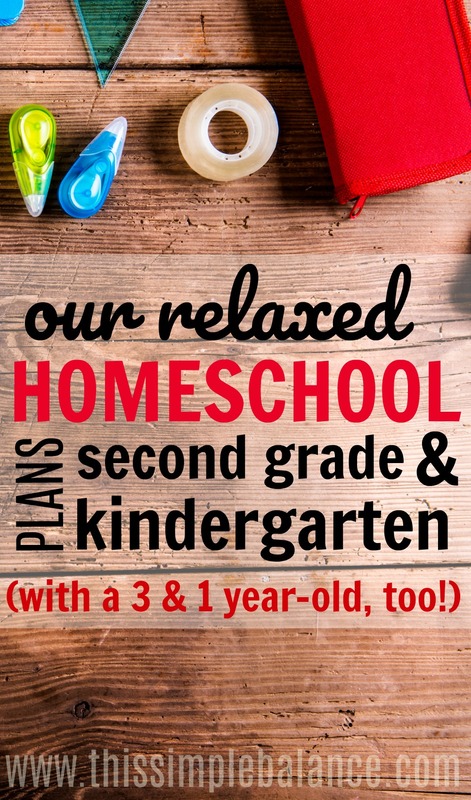 I hope our second grade homeschool plans help you make the best choices for your family and homeschool style. Who is this relaxed homeschool mom? But first, who am I? My name is June, and I am an unlikely homeschooler. I had this faint dream of homeschooling but never thought I could actually do it. I was already overwhelmed with three (and then four) little kids. I spent a lot of time just treading water – keeping up with the meals and the laundry and the finances and the cleaning. There was no extra time or energy or space for homeschooling, as much as I wanted to homeschool. We sent our oldest daughter to a university-model school at the age of 4 (almost 5) in 2013 because I wanted extra support to give homeschooling a try. She did not thrive there – asked to stay home all the time. While she did learn how to read, I was flabbergasted that our seeming extravert hated school. I agonized over the decision: to homeschool or not to homeschool. I took a gap year with our daughter the following year because 1) I was having a baby at the end of December and 2) I didn’t need to report to Boston Public Schools until my daughter turned 6. We finished up some leftover curriculum and workbooks from the previous year until the baby came. Then, we just read-aloud and did some informal school the rest of the year. We determined that our daughter needed all homeschool or all regular school. She didn’t do well with a mixed schedule. Because I didn’t believe I was capable of homeschooling, we decided to apply to a private Christian school. For a variety of reasons, the financial aid we needed did not come through. I took a deep breath, uncertainly asked my husband if he thought could homeschool (he said yes), and I jumped in. So much has changed since that first year homeschooling on my own. I started with a boxed curriculum and very quickly transitioned to eclectic homeschooling. Unschooling, relaxed homeschooling, Charlotte Mason, and Brave Writer lifestyle all influence my current homeschool style. I am passionate about the value of play. Kids need play, and they need it and lots of it for much longer than our society typically makes time for it. By play, I mean unstructured, imaginative play – NOT sports and music lessons and dance class. I believe kids learn SO much in play that we cannot possibly teach as adults. Second, books like these ones sold me on the power of reading aloud. I read-aloud to our kids daily. 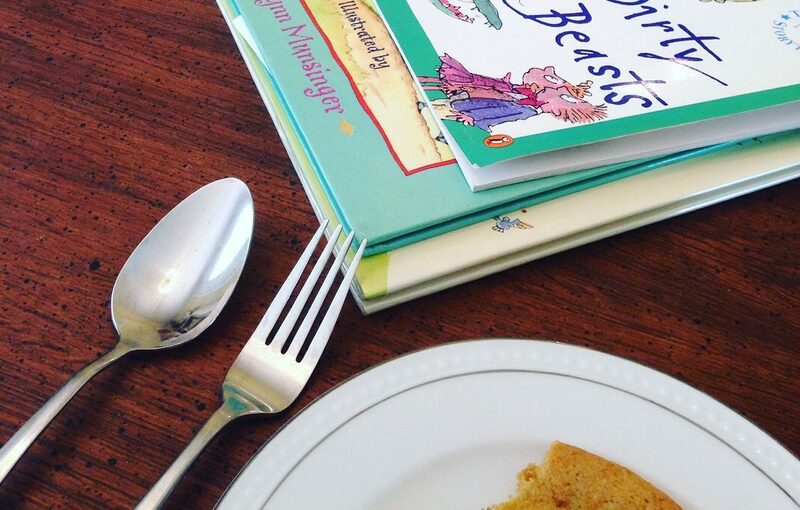 I read picture books with our boys (our daughter still listens and loves them!) and about 45 min – 1 hour of a chapter book to my daughter. These two values, along with my Christian faith shape our homeschool more than anything else. This year, I will have one child “officially” in school. Our daughter will be in second grade, at least according to the State of North Carolina, and turn 8 in October. How can that be?! My son will be 5.9 at the start of the school year, and we do very little formal instruction. He has recently (finally) expressed an interest in doing more formal reading work. We will be working our way through these books, which I find so straight-forward and easy to use. The stories are hilarious – a major plus for boys! Our formal schoolwork will be mainly targeted at our second grader, but I expect that as the school year progresses, our five-year-old will want to be more and more involved. This is what we will be using for our 2nd grade homeschool curriculum this year. For language arts, I use Brave Writer. When I first came across this curriculum, there were so many conflicting reviews that I clicked away. I couldn’t handle a controversial, maybe my kids won’t be able to write, kind of program at the time. Thankfully, I encountered Brave Writer again after I started blogging, and Julie’s message immediately resonated with me. You see, I used to be a grammar and language mechanics stickler. I could point out a typo or grammatical error from a mile away. But I HATED writing. I didn’t want anything to do with it. Why? I never wrote about anything I cared about. I always wrote what the teacher assigned, and it was never something I wanted to write about. I did the assignments and usually received high marks. After all, every “i” was dotted and every “t” was crossed. The grammar was impeccable. Was it interesting to read? Probably not. I could write an academic paper, but anything else? No way! When I thought about blogging, I didn’t think I could do it. I hated writing! But once I started trying to write about the things I cared about, I realized that I didn’t hate writing. I hated writing about boring things I couldn’t care less about. Brave Writer focuses on creating a language rich environment – not stifling a child’s natural writing voice by focusing only on mechanics. We will continue to read-aloud every day. We are finishing up the Harry Potter series and will be starting on the Chronicles of Narnia from Book 1. I managed to snag this beautiful set at a consignment store and on Ebay. After that, we will probably move on to Roald Dahl’s books. Nighttime read-alouds are my choice; daytime reading is my daughter’s choice. She prefers listening to audiobooks for more advanced content, but she also reads physical books. I make suggestions and often help her find new books, but I try to stick to her interests. I do not require reading time. She loves to read and goes through spurts. Sometimes you will find her in her room for a couple of days listening to the latest books in this series, and other times she will go 4-5 days without reading beyond our nightly times. We will continue to do poetry tea time every Wednesday (this poetry book is our current favorite). What does poetry teatime look like? Right now, it’s a time to enjoy a treat and a fun beverage and read funny poetry. 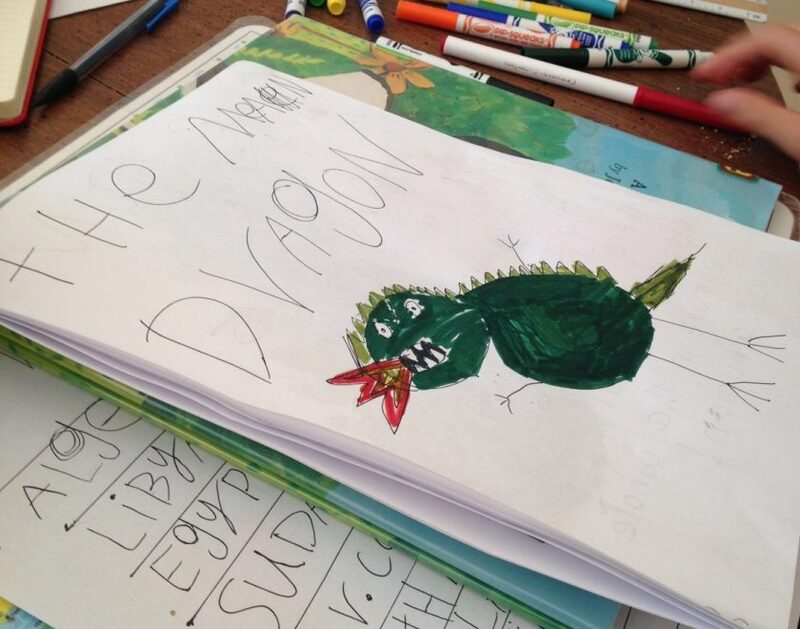 Often, my kids ask to write their own poetry when we finish reading. I am still gathering ideas for poetry teatime. For more, see this post by Rebecca at Hip Homeschooling. We are going to attempt to implement Friday Freewrites, another aspect of the Brave Writer lifestyle. Currently, this will simply look like dedicating time to writing with no prompts from me. My daughter already loves to write short stories, and we will attempt to ease our way back into copywork by copying quotes from books we love. If you want to get started with Brave Writer, I recommend checking out the core curriculum book: The Writer’s Jungle (found under Home Study Courses => The Writer’s Jungle). To learn more, the Brave Writer Youtube channel is a wealth of information! Finally, we are trying the Big Life Journal this year as a way to teach growth mindset. My oldest tends to be a perfectionist, though she is getting better. At any rate, I want to try this journal and see if it helps her to see her life and work through a lens of growth instead of perfection. Everything else? Writing lists, letters, notes, quizzes. All of these things are already a natural part of our everyday life. We love math! Math is also very natural part of our life. We use it all the time: baking and adding up coins and calculating distances and finding the best deal at the grocery store. I finally found the courage to sell our old math curriculum, one that I fully intended to use but that didn’t really fit our relaxed homeschool, story-centered style. Getting rid of it was admitting we would never be the structured, workbook, check off a million boxes type of homeschoolers, and sometimes it’s hard to let go of your ideal imaginings, whether they would be good for your family or not. I love the Life of Fred elementary math series because it aligns so well with my favorite way to teach: stories. Life of Fred consistently shows how much math is interwoven with everyday life. Bonus: my kids laugh SO MUCH at all of Fred’s antics! That being said, I do not use it exclusively. My personal opinion is that it’s best used in conjunction with everything else we do for math. 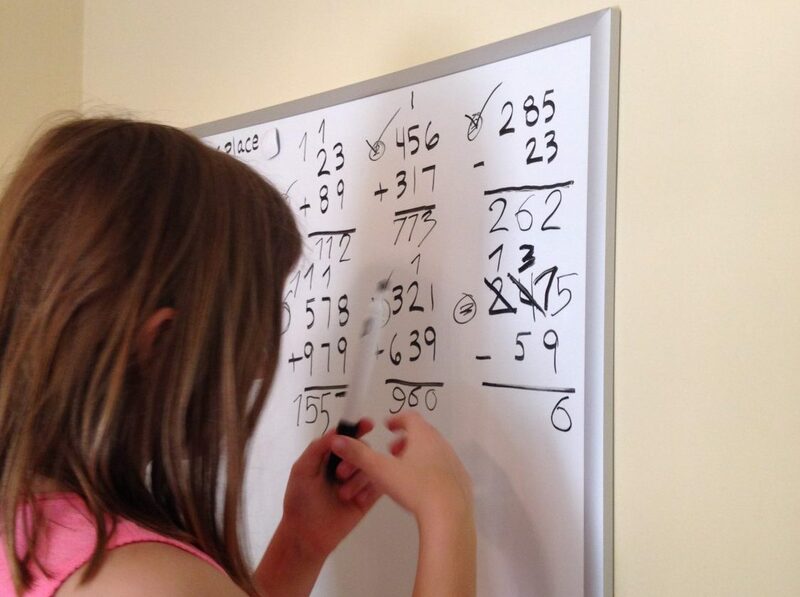 Our daughter, soon to be in 2nd grade, loves to practice math. I also love teaching math the good old-fashioned way. Long addition, long subtraction, estimation – all of these things can be taught the way we learned them growing up (as opposed to today’s complicated methods that supposedly teach kids to think abstractly – it’s a problem when engineers and math majors can’t help their kids to their math homework! Just sayin’). We will be starting Story of the World this year! I am excited to start a more formal history program that is story-based. I love history and look forward to listening along with my kids. While I was originally planning on using the audiobook version, I realized that I needed to be hands on in this subject, especially for the boys’ sake. I stop often to clarify topics, I ad lib and emphasize different sentences to grab their attention. To keep little hands engaged, we will color the activity sheets and maps for each chapter. Our family loves geography, and again, it is a natural part of our lives. 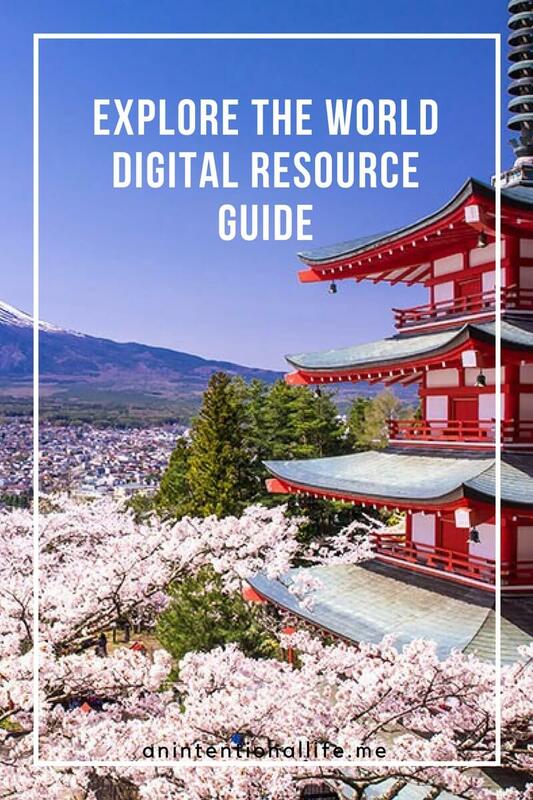 We will be using this course to supplement our geography studies and studying one country a month using the resource guide. The course provides picture book lists, video tours, how to draw landmark tutorials, and more. Along with spending time with Jesus in the mornings (worship and practicing hearing God’s voice), we are reading through Egermeiers’s Storybook Bible at lunch. And that, my friends, is all we have officially planned for the year. Science studies will be informal: nature walks, science books, science experiments every month from this kit. Lots of reading, lots of audiobooks, lots of play, some field trips – it’s going to be a great year! Second grade is still young. Kids this age still need a lot of unstructured time for the best form of learning: play. They need far more than most second graders receive in our country and in the world, for that matter. Choosing to homeschool second grade will give them the time they need to figure out who they are, know their strengths and weakeness, what they love to do and do not love to do. Whatever second grade homeschool curriculum you choose, just having those extra hours will make it absolutely worth it. Oh! And I totally count watching Wild Kratts and Magic School Bus as our science (along with nature walks and field trips and podcasts and good books)! I have sometime felt guilty about our relaxed approach, but I am feeling good right now!! I need to reread my own posts, when I feel guilty about our relaxed homeschooling, too. LOL. It’s always so good to know you’re not alone – it helps! Wow! You are such a kindred spirit! We also started with a curriculum package (Oak Meadow) in first grade and dropped it after about 9 weeks, all except for the wonderful literature! Then we picked up Bedtime Math, subscribed to Spangler Science, did lots of re read-alouds, and kept working on reading with Bob Books and simple children’s books. 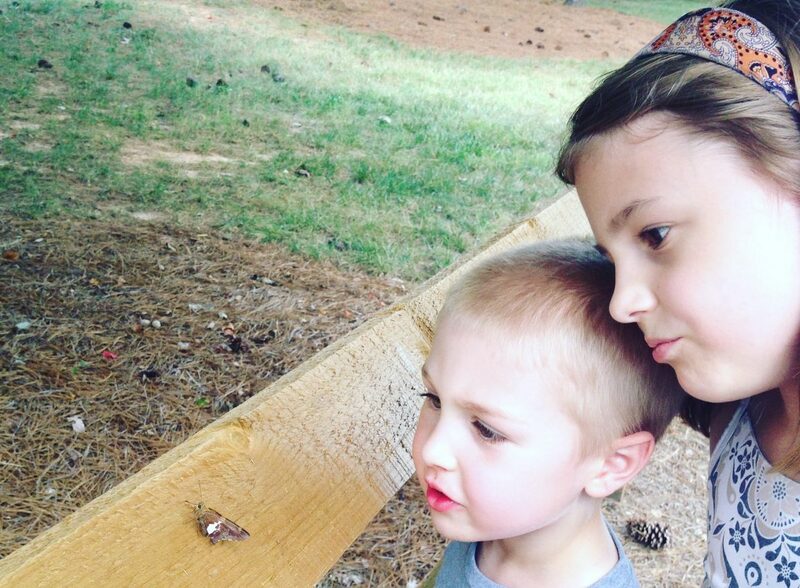 This school year, for 2nd grade, I tried Wildwood, a secular no-guilt Charlotte Mason curriculum, which basically meant more wonderful good books (we only used the ones that we really liked though), and attempts to spend more time outdoors. We tried Life of Fred and Miquon, now morphing to playing more games and rereading Bedtime Math books and discovered Brave Writer! We also got Story of the World, but ended up reading American Tall Tales and then a story based American History (recommended by Wildwood). An homeschooling friend recommended that I check out your blog, and I see why! Thanks for sharing! It’s great to see other people with a similar approach! So glad to “meet” you, Stephanie! Yes, the search is always on for wonderful books. We’ve read our share and are always on the hunt for more. How is Brave Writer going for you? What resources are you using right now? I bought the Writer’s Jungle, but haven’t used any other products yet. We are just living the BraveWriter Lifestyle. I keep meaning to write about it, and it keeps getting put off. American Tall Tales sounds interesting – I’ll have to look into it. Once we finish Story of the World, I will need an American history text. So glad you’re here, and I look forward to connecting with you more!